In a clustered environment services can be dynamically created and moved around due to reasons line node failure, maintenance or load rebalancing etc. In each of these cases the client need to discover the address the services running on the cluster. Using a service-registry to which the service must register itself once started normally solves this problem. Etcd being a distributed and highly available data-store can be used as a service-registry to maintain records of services available in the cluster. Directory APIs exposed by Etcd provide a convenient way to group related configuration records. Lets take a brief look at these APIs and how these APIs can be used to provide a Service Discovery mechanism. Etcd stores data in a file-system like hierarchy, the key-value pairs can be stored in a directory and a directory can be nested within another. Directories are automatically created if they are part of the path of a key. Another interesting directory feature is the support for ordered keys. This API allows the Directory to record the order in which the key value pair is added to it. As seen in the previous section the directory APIs can be used to group together related records and create a hierarchy of records. These features of the data-store can be used to store information about service, the hierarchy of these records helps in creating a dependency tree like structure. As etcd is able to maintain the order of entries added to the directory it help is creating a queue like structure. Lets try to create a hypothetical service record using these APIs. For our example lets, assume that all services will be registered under the “_services” directory. When the mysql service is deployed in the cluster the deployment process will create a service record for the database service as a directory ”db” with records such as “mysql:host” with value to the mysql server host amd “mysql:port” with the value of the port used by mysql and so on. Similarly other services deployed in the cluster should register themselves by creating directories under the “_services” directory. For a client to discover all the services available on the cluster all it needs to do is to list the contents of “_services” directory. 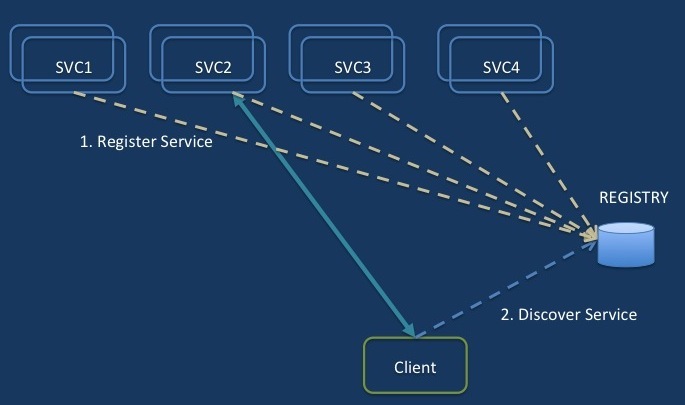 With service discovery we solved the problem of publishing the services available on various nodes on the cluster, but as etcd is a distributed services itself the client needs to know which nodes to send the Etcd commands to and what id the node that the client was communicating with fails. Etcd proxy tries to resolve this problem by running an instance of etcd locally on the client node. 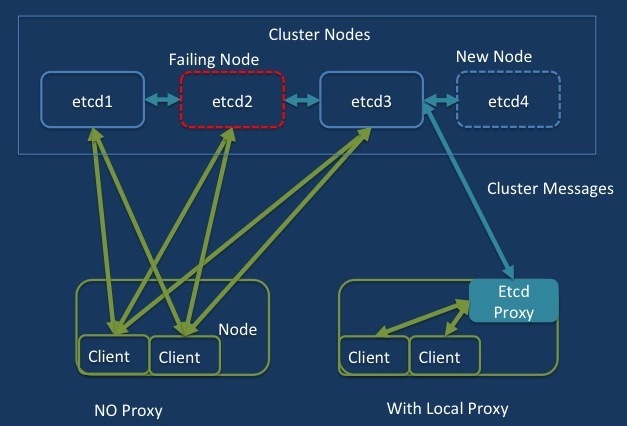 The Etcd instance on the client node acts as a proxy to the real Etcd cluster and forwards all calls to the real cluster. The proxy instance does not participate in quorum formation or replication of configuration data. This means that the client need not know about the cluster nodes or which node in the cluster is actually active and which one has failed. To start a etcd instance as a proxy the –proxy flag should be set to “on” or “readonly”. In addition the proxy needs to be told about the initial cluster members with the –initial-cluster flag. More details can be found in the documentation. In this post we looked at the Directory APIs provided by Etcd and how those APIs can be used to provide a service discovery mechanism. We also looked at the proxy mode in Etcd, which helps in simplifying client configuration. In my previous blog, we looked at Etcd a highly available distributed configuration data-store, in this post we will look at the API exposed by Etcd. We will use our previous setup to try these APIs. Finally we will develop a very simple HA application based on Etcd APIs and test service failover. Etcd exposes REST based APIs for accessing the data-store, cluster configuration and statistics. We will mostly focus on the data-store API for this post. Etcd stores data in key-value pairs; in the previous blog we have already looked at using etcdctl to store a key-value pair in the data-store. In this post we will use curl to interect with etcd. To store a key-value pair of “my_key”, “my_value” we use the following command. client $ curl -L http://1.1.1.1:4001/v2/keys/my_key -XPUT -d value="my_value"
Deleting data is as simple as using the DELETE verb with HTTP. Etcd allow storage of key-value pair with an associated timeout. Here is an example usage. Etcd allows conditional updated of key-value pair. This means a data update is allowed only if given criteria are met. client $ curl -L http://1.1.1.1:4001/v2/keys/my_key -XPUT -d value="my_value1" -d prevValue="my_value"
client $ curl -L http://1.1.1.1:4001/v2/keys/my_key -XPUT -d value="my_value1" -d prevExist="false"
client $ curl -L http://1.1.1.1:4001/v2/keys/my_key -XDELETE -d prevValue="my_value1"
Now that we have looked at the basic data-store APIs of Etcd let use these APIs to build a simple HA application. We will use the Etcd cluster setup that we built in the previous blog and extend it to include two server node which will be running our HA application. Following is the cluster setup for this test. The application simple makes the shared service IP address of 1.1.1.50 highly available. The application code is available here. The code will be running on both the servers (Server_1 and Server_2) one of them will act as the master node and host the service (Shared Service IP) in case of the master nodes failure the service will be moved to the backup node. The following diagram shows the working of the application. 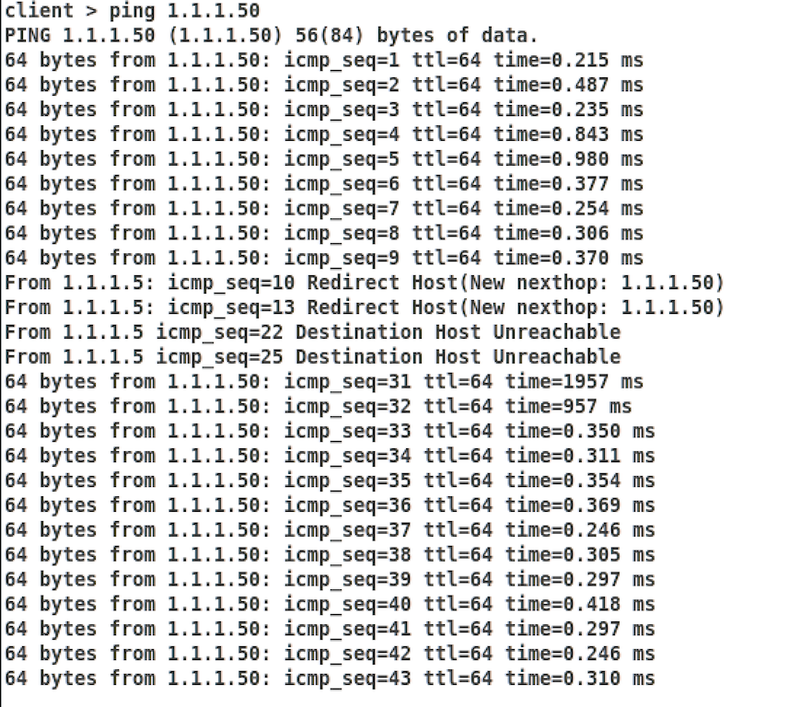 The Client node constantly tries to use the service (ping the Shared Service IP). Here is an example of service disruption during node switchover. 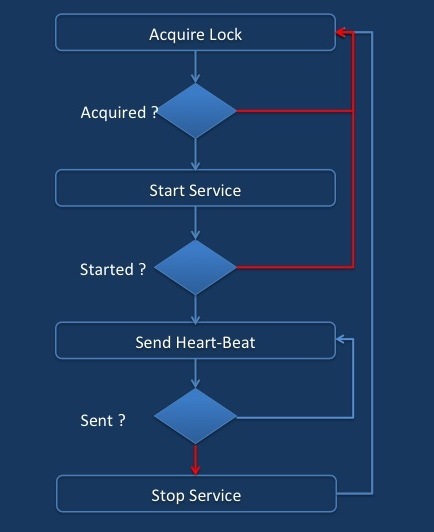 The key to running a shared service by the two-node cluster in our example is acquiring the lock and the heart-beat mechanism. Lets look at the application code and see how Etcd API provides these clustering mechanisms. The application uses compare-and-update operation to setup a new key (my_service) it then uses data update with TTL value to keep holding the key. This prevents the second instance of the application to start the service. Etcd thus provides a distributed locking mechanism for the clustered application. In this post, we briefly looked at some of the interesting data manipulation API exposed by Etcd. We used these APIs to develop a simple HA application. In the following post, we will look Etcd and service discovery. Etcd uses Raft algorithm for cluster formation and consensus building. In this post we will look at details of cluster bring-up process of Etcd. In a distributed data store cluster, data consistency is achieved by consensus within the majority of the cluster members. Raft is a leader based consensus building algorithm. A cluster node participating in Raft can be in one of the three roles leader, follower or candidate. A leader is the node to which the clients communicate. The leader is responsible for maintaining the consistency of data. All other nodes are followers and follow the commands from leader. From the point of view of the client, the system behaves exactly like a single node server. The cluster leader maintains consistency of data by making sure that any change in data are made only by the leader and acknowledged(and replicated) by a majority of cluster nodes. 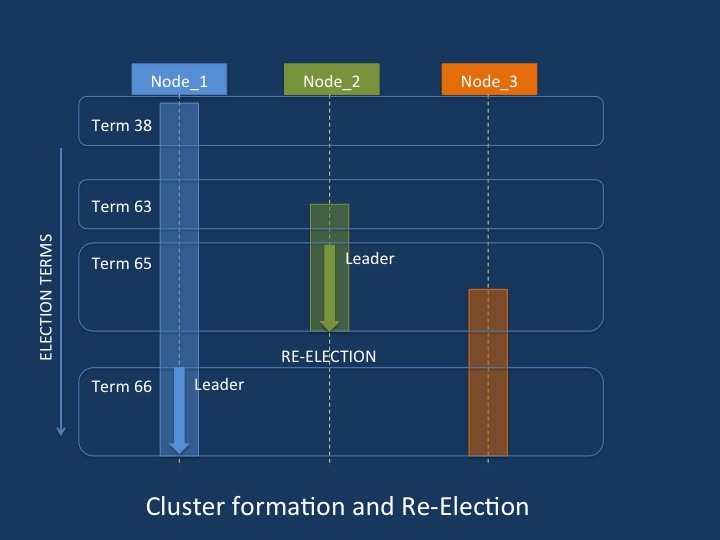 If the follower nodes in the cluster detect lose of leader node (if they do not receive heartbeat from leader) they transition to candidate role. The candidate nodes then contest for a leader election and tries to become a leader by asking for voles from other candidate nodes. If one of the candidates receives a majority, it is chosen as the leader, else if there is a split vote a new election is started and the process repeats. Every time an election is started the term of election is incremented. We will not cover the details of Raft in this blog. There are many good resources on the net that describe Raft. Node_1 starts and waits for votes from other cluster members, as none of the other members are alive quorum cannot be reached. Node_1 goes for re-election after incrementing Term. This process continues till Term-63 is reached when Node_2 joins the cluster. Election term 63 and 64 are unable to elect a leader, but in term 65 Node_2 is elected the Leader. Node_3 later joins the cluster. It receives a heartbeat message from the leader and assumes Follower role. The Leader node, Node_2 is stopped to simulate a node failure. Leader lose is detected by Node_1 and Node_3. 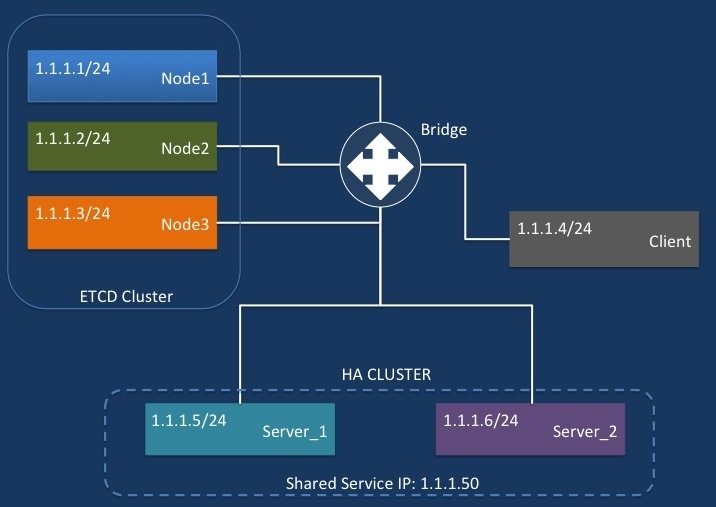 In a multi-node cluster hosting a service, each node needs to have a consistent view of the shared service configuration. At the same time, it is important that the configuration remains highly available and should be able to survive node failure. Etcd is a highly available, distributed configuration data store designed for a clustered environment. For a distributed system to remain consistent, its data needs to be in agreement with atleast the majority of the cluster members. Consensus building is the process of bringing in an agreement within the majority of the cluster members. A cluster must constantly strive to be in consensus for its data to remain consistent. Etcd uses Raft algorithm for building and maintaining consensus in the cluster. To try out Etcd we will need a cluster setup. For our testing, we will create a very simple cluster setup using Linux network Name-Spaces and different directory for the node data store on a Ubuntu 14.10 Virtual Machine. The following diagram describes our setup. The setup has three cluster nodes and a client node for testing. All the nodes are implemented with network Name Spaces and connect to a bridge on an OpenVSwitch instance (Linux Bridge can be used as well) using veth pair. Aadditional nodes can be added with the add_node.sh script. Run setup.sh to bring up 2 nodes. Run add_node.sh to add 4th node to act as client. Download a pre-built version of etcd from github and extract the etcd and etcdctl binary. Etcd provides flags to configure its runtime behavior, for ease of use, I have wrapped the flag settings into a script etcd_start.sh. This script assumes etcd binary in the current directory. 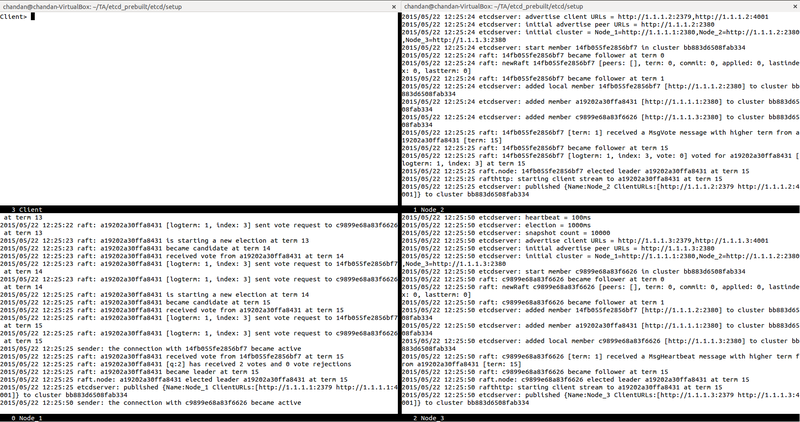 You can use screen or terminator to open multiple terminals to monitor the formation of cluster. The setup script in the previous section created a namespace per node. On 3 different terminal start a shell in the namespaces using the following command, replacing node_number with actual node number. Cluster formation on my test setup is captured in the following screenshot. Etcdctl is the client that can be used to interact with the cluster. Etcdctl needs to be told about the cluster endpoints. Lets try to set a data item and retrieve its value. Client $ ./etcdctl set name "Chandan Dutta Chowdhury"
In this post, we looked at Etcd a distributed highly available configuration data store for clustered environment. We also looked at the cluster behavior on lose of minority and majority members . We now have a 3 node etcd cluster to try basic etcd features. In the following posts we will look at details of etcd APIs, service discovery and creating a simple application using etcd.